Mazatapec mushroom spore has great rhizomorphic mycelium that will grow tall slim fruits with caramel red caps. Full flushes of shape shifting Mazatpec mushrooms will provide enough caps for spore printing. The Mazatapec cubensis characteristics makes it a great mushroom strain to work with. Get this print! Trivia: The Mazatapec psilocybe cubensis a.k.a the original TEONANACTL is a real spiritual mushroom strain from Mexico. Used by the Mazatec tribe in Central America in Shamanic healing sessions and rituals this can well be the first psilocybe cubensis strain that was cultivated by man. The Mazatapec spore prints are made on sterile foil which is stored in sterile ziplock bag and kept under refrigerated conditions. 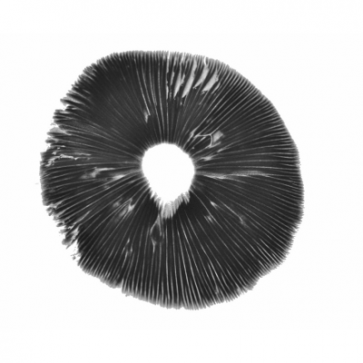 Each spore print can have a tiny scratch of spores removed from the print. With this swab a test run on agar or liquid culture is made to check the conditions of the spores. Only spores that germinate are released as a print. Store the Mazatapec Spore print refrigerated between 2*C-8*C Celsius or 35*F-46*F Fahrenheit. A Mazatapec Spore print can be stored for years.